VOLOOM Rootie The Rootlifter is a perfect choice for finer, thinner and shorter hair (at least 4" in length suggested). Unlike other root boosters, the secret to VOLOOM is in the patented plates. Used in the under-layers of hair, Rootie creates hidden volume pockets that lift the top layers up and away from the scalp and face, helping to take years off your appearance. 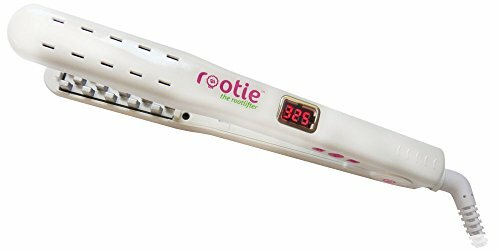 By lifting and separating individual hairs, Rootie creates that lift you've always wanted. No mousses, gels or sprays that weigh hair down and leave it looking flat, dull and lifeless. It takes minutes and is so easy anyone can do it. Hold Start button for 3-5 seconds to turn on. Start at a low temperature and then section off the top layer of your hair that you would like to stay smooth, and clip it off to the side. Use VOLOOM Rootie on the layers of hair underneath this top layer, gently clicking and quickly releasing 2-3 times down to eye or cheekbone level. You only need to hold the tool on your hair for a second. Once done, cover with untreated hair. As with any heated iron, too much heat can be unhealthy for your hair. A heat protection product before using any heated tool is recommended. Try lowering the temperature until you find the temperature that leaves only a slight imprint, but not a clear pattern. If you want even less imprint from the plates, try not closing the plates completely. Adjustable temperature settings from 220° F to 395° F allow you to experiment and find out what temperature works best for your particular hair type. If you have any questions about this product by VOLOOM, contact us by completing and submitting the form below. If you are looking for a specif part number, please include it with your message.